2018 The Soden Collection, Shrewsbury, Shropshire. Group exhibition. 2018 Drapers Hall, Shrewsbury, Presented by The Soden Collection. 2018 Cheshire Art Hub, Chester. Group exhibition. 2018 October Manchester Art Fair, Manchester. UK. 2018 Jun-Jul Cheslsea Cross, Fulham Road, London. 20 Paintings, 20 Venues Solo exhibition. 2017 October Galerie Nord 49R, Lille, France. Two artist exhibition. 1. Do you consider yourself as an emerging artist in contemporary art? Ian Rayer Smith : I hope so. As a contemporary painter, I’ve been constantly experimenting and evolving to the point where I have now established my own artistic identity that validates me as an artist. Having said that, in many ways I feel I’m only at the beginning. Ian Rayer Smith : I would say I’m a contemporary expressionist, I like my paintings to show a raw honesty and passion in the way the paint is applied. I also want my work to look contemporary, current, fresh and of its time, although there are definitely classical references to be seen in my work. 3. Can you talk about your formative years as an artist? Ian Rayer Smith : I started painting relatively late in life after a career in business. Initially it was a distraction from the strains and pressures business life. But, slowly, painting began to take over. I wasn’t particularly well versed in technique at first, but I enjoyed it immensely. I gave up the corporate life and went to art school when in my late 30’s. Four years later, after completing my studies, I had established a definite sense of artistic direction, as well as valuable skills. I just knew I wanted and needed to paint full time. 4. Do you remember your first interaction with art? Ian Rayer Smith : I suppose the most impactful memory was seeing a particular contemporary painting in a gallery which inspired me to start painting myself. I bought that painting, I still have it on my wall. 5. What other artists influence you, both contemporary and historical? Ian Rayer Smith : There are so many artists that have influenced me. I think it’s important as a painter to know what is happening today in painting and what has happened before. It really helps in contextualising one’s own work and position. I’ve always been influenced by the abstract expressionists – for their passionate paint handling, invention and, most importantly, for the freedoms that come from dispensing with the representational image. Over the years I have looked further and further back in time, and in particular I’ve found the Renaissance to be a hugely inspirational period. I find the use of light, dark and compositional techniques to be thrilling and strangely contemporary. I have always been fascinated by the abstract expressionists. Their reputation was made mainly by the masculine, almost macho works of the better known names, but in fact my favourite artists from the abstract expressionist movement are predominantly the female painters. Joan Mitchell is probably at the top of the list. Her paint handling seems so much more vibrant, visceral and passionate than that of any of her male contemporaries. Also, Willem de Kooning and the lesser known Milton Resnick are hugely important to me. I admire many of today’s major contemporary painters, especially Albert Oehlen, Adrian Ghenie, Georg Baselitz, George Condo, Cecily Brown, Eddie Martinez and Philip Guston. However, when I look at these painters, their subject matter almost seems less important to me than the inspiring way in which they handle their materials. 6. How did you first begin to develop your unique style? Ian Rayer Smith : About three years ago, I hit a ‘block’ in my work, like most painters do at some point. I had reached a stage where I did not know what to paint or what I wanted to communicate, and it felt that the ideas I had may be bogus. The idea of painting something representationally seemed stale. That’s when I became interested in psychic automatism and the work and teachings of Franz Kline. He essentially believed in first ‘pouring out’, then editing. I also became interested in artists whose work is centred around mark making itself. You could say my style combines these systems with my own ideas. Colour is more important to me now than it ever was, and I love the expressiveness and experimentation it can offer. 7. How do you manage to fuse abstraction, the figurative and the surreal? Ian Rayer Smith : Pure abstraction often lacks passion. Therefore, I feel it’s important to have some figurative element, or the suggestion of one. I want my paintings to have an emotional impact, and so the injection of organic elements can be a helpful tool for me. Yet I’m not interested in the recognisable human or any other figurative form. I lean towards the creation of new forms, that suggest something living in the image. Doing this means that I am not restricted by conventional figurative forms, which gives me far greater creative freedom. I love the element of surprise that this can bring to my work. 8. How do you nurture your creativity? Ian Rayer Smith : I like (and need) to paint every day. I have two studios, so having one at home and another away from home makes this easier to do. I have a strict routine, and I’m definitely at my most creative in the morning, so I start very early in the day. I draw a lot as well, although generally this is done as a form of warming up, rather than as preparatory work for my paintings. 9. What can you tell us about your painting process? Ian Rayer Smith : I find it easier to work on several paintings in a series, and I often have many paintings in progress at any one time. For me, that keeps things very loose and free, enabling me to avoid ‘tightness’ in any particular painting, which can stifle the energy in a piece. I also like working on various scales and surfaces, changing things to avoid get too comfortable or formulaic. I have to have an idea of what I’m going to do, but it nearly always changes and develops during the act and process itself. I find this keeps things energetic and exciting. Occasionally, accidents will happen, and I will often embrace them and use this creative energy to inform new works and ideas. I need to paint in isolation. I’m at my most comfortable when I’m in my Manchester studio, where I get the buzz of the city around me, yet I’m alone and don’t get distracted. 10. What can you say about the difference between light in a painting and light in nature? Ian Rayer Smith : Light in a painting can be used to create emotion. In a painting you can exaggerate the light to highlight certain areas or elements in that painting. It helps to bring life to an image and create mood. 11. What are some of your favourite art world hangout spots? 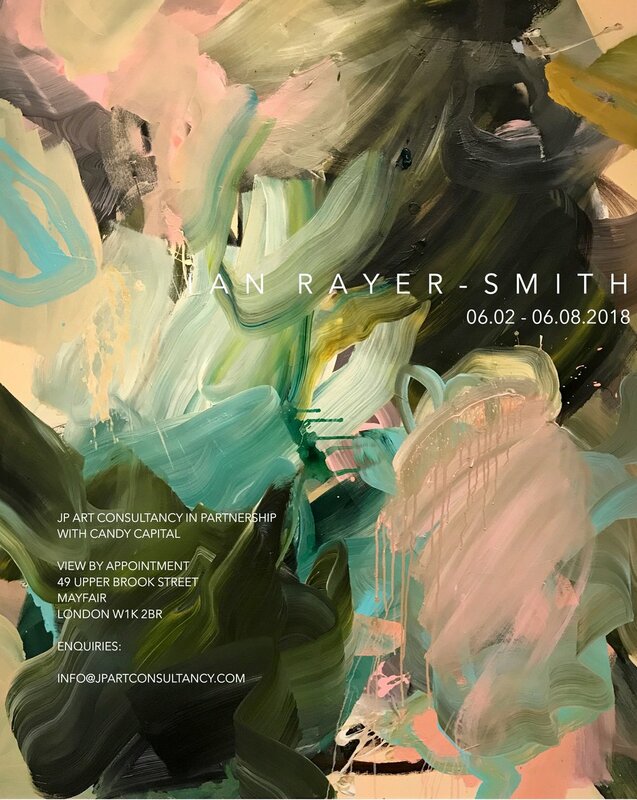 Ian Rayer Smith : From where I have been so far, it is hard to top walking around the Chelsea Gallery District in New York. It is so dense, with literally hundreds of important commercial art galleries. The Broad in Downtown LA is also an amazing building with a very impressive collection of contemporary painting and sculpture. The Louvre and the Pompidou are both breathtaking in their quality. The Saatchi in London is always great fun. 12. What are your future goals and ambitions as an artist? Ian Rayer Smith : I have always thought of different ideas, goals or objectives for my own future as an artist. Yet, as many will know, it’s a very difficult world to crack. I like the challenge of that. I’m selling my work, and it’s very humbling when somebody wants to own something that you have made, something which is produced in a very personal way. Ultimately I want to have some recognition in the art world as a painter of some importance. Being represented by an established gallery can allow me to dedicate all of my time to creating the work. (ON) How long have you been making art? (IRS) I'm a bit of a late starter really. I was immersed in the rat race for twenty years running my own business. Whilst on holiday in the States in 2006 I saw a painting and decided I needed to paint. I have not stopped, it's taken over my life and now I'm painting full-time. If I could I would probably be in my studio 7 days a week. (ON) What genre best describes the kind of art which you create and how has it evolved since you began? (IRS) I suppose I'm a 'Contemporary Figurative Expressionist'. I've always been obsessed with the Abstract Expressionists. As my work has developed I've been searching for new ways to continue this- combined with surrealism, my own experiences, contemporary inspirations and concepts. My work is less literal now, although I like to reveal and suggest things in my paintings with usually one figurative element, I think my paintings have become more surreal. I like to work on very large paintings, yet in the last year I have begun to enjoy a much more intimate scale. I don't like to tell obvious tales with my paintings, I'm more interested creating images that create some sense of mystery. (ON) You managed to graduate with a First-class honours degree, how did you achieve this and what did it entail? (IRS) I think when you study later in life you tend to enjoy it more and work a lot harder. I don't think I would have worked quite as hard if I'd had gone to University straight from school. As you get older you have a desire to obtain more knowledge. (ON) You've shown your work at several exhibitions in Manchester, but our 'Framed Exhibition' will be your first in London, what made you decide to exhibit here? (IRS) I'm very excited to be showing at this years 'Framed Exhibition' and to be able to have direct access to the public. London is one of the important 'Art Capitals' of the world, it's a great opportunity for an emerging artist like me to gain access to the London market and meet new audiences. (ON) How do you create paintings and what is your process? (IRS) I create mountains of sketches, most are discarded but sometimes I latch onto an idea that interests me enough to push forward. I often hide away completed sketch books to then revisit. I find that rediscovering things later can be more interesting and give feel of detachment. I like to combine these ideas with new ones and mix them into the pot. (ON) Is there a medium or technique that you have yet to try but would like to? (IRS) I'm obsessed with paint as a medium, but I'm aware of an underlying need in me to work in 3D. (ON) What would your ideal solo exhibition be like and where would it be held? (IRS) I'd love a solo show in London one day at a major gallery. (ON) Do you have a favourite artist or painting? (IRS) There are many artists and paintings that I admire, both historic and contemporary. If I had to pick one artist, I'd have to say Milton Resnick. His whole attitude to painting fascinates me. (ON) If you could change anything about the art world, what would it be? (IRS) That's a big question. All emerging artists want to be a part of it, and we have to find our own way in. It's changing fast and that makes it exciting. I suppose I would ban pointillism. (ON) What are you planning to exhibit at the New Artist Fair in March 2015? 8 artists from the North West who have never exhibited together before have been assembled for the first time for a major exhibition of their intensely personal and powerful work, as part of the Manchester Pride Fringe Festival. This dynamic show, part of Manchester’s rapidly growing and popular Fringe arts and cultural event for the annual August Pride celebrations, is to be found at the very edge of the Village. The extraordinary diversity of these artists reflects the fact that they do not come from one single group, studio or academic institution. The work they produce is drawn from enormously different backgrounds and life experiences, from which a compelling show emerges. 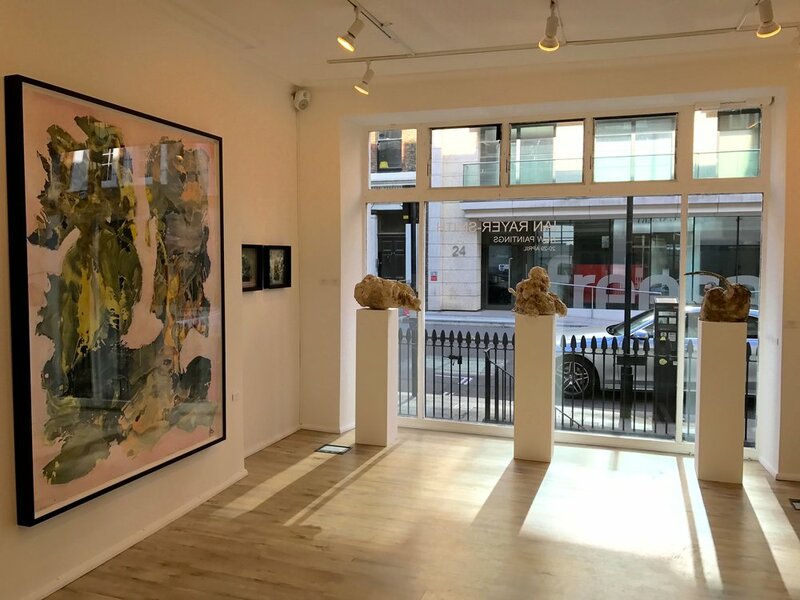 Carefully curated by artist Ian Rayer-Smith, “Off Kilter” presents a large exhibition of paintings, photography and sculpture. “I wanted to select artists who I did not just admire, but who created work with an underlying sensitivity which would challenge us to ask questions rather than immediately give obvious answers”. Ian explains, “The diversity of these artists’ backgrounds, working processes and approaches to art makes for interesting individual subjects which also make strong connections with each other. I am thrilled to have these artists showing together, and there is certainly something here for everyone”. The featured artists are Ian Rayer-Smith, Lee Baxter, David Hoyle, Emily Pitts, Darren Nixon, Marcus Wemyss, Mat Cahill and Colin Lloyd. The range of scale of the works is as dramatic as the subjects they cover, with large expressive paintings juxtaposed with delicately rendered and intimate images and sculpture. This is a must see exhibition. “Off Kilter” is on at Piccadilly Place, between Canal Street and Piccadilly Station, Manchester. Opens on 23rd August and is on until 30th, with a private view on Thursday 22nd August from 6pm. Please visit http://offkilterartists.wordpress.com/about/ for more information and opening times.